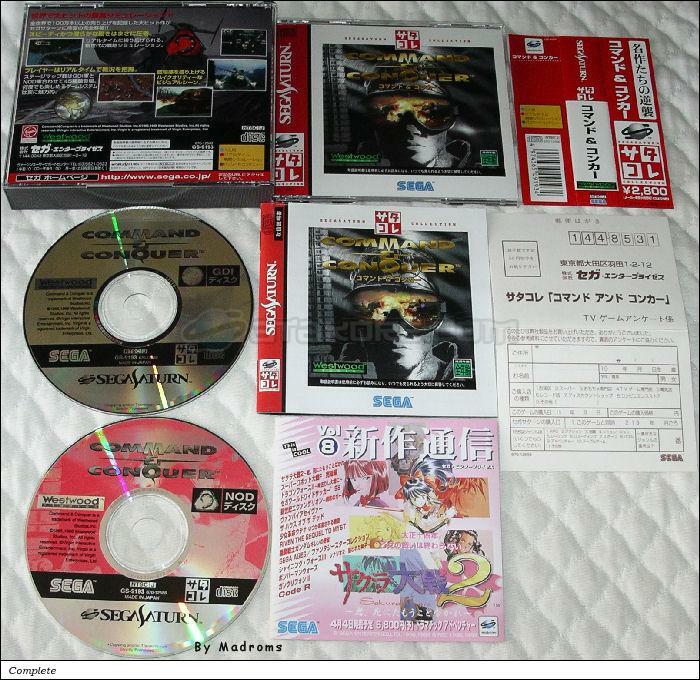 Command & Conquer (Satakore) (コマンド　＆　コンカー　（サタコレ）) is a Simulation - War game, published by Sega Enterprises, Ltd., which was released in Japan in 1998 for the Sega Saturn. Shame on you if you never heard about Command & Conquer - the greatest progenitor of the whole Real Time Strategy game style. Well, only after Dune 2 and Warcraft paved the basics of course. Still it was C&C that layed down the basics of the smooth and simple controls, ressource management, and gameplay, that most RTS games followed. So how does this PC orientated game style translate to the Sega Saturn? Brilliantly well! The biggest issue of a console C&C game is naturally the control mechanism. A gamepad just cant mimic the precise and fast movement of a computer mouse. Combine this with the keyboard which gives you near limitless options for team assignments, movement options, et cetera. The Saturn handles this obstacle fairly well: A and B work like the left and right mouse buttons, respectively - A selects, B deselects and cancels. X, Y and Z are used for teams assignment - hold down R and press any of the 3 buttons to assign a team. You can then select the team by pressing the button again, without R. Other then that, R is used for increasing the scroll speed of the cursor. Lastly, you can use the L shift to force movement (to crush infantry with tanks for example), or cycle through repair, sell, and guard modes. C opens up the sidebar with build options and the minimap, while L+C opens it up but doesn't make it active (so you can still watch the minimap and build queue, while still controlling units). The build menu is slightly different compared to the PC original, as you have buildings, infantry, vehicles, aircraft and superweapons in different rows, similarly to the later PC sequel Red Alert 2. While the controls may seem tight on the first try, with a little practice you'll find that even unit micromanagement is easy with them. And with the control problems out of the way, you get pretty much the same game as on the PC - minus build animations for structures. And a few explosions are lower quality, possibly due to memory restrictions. But everything else pixel perfectly matches the original MS-DOS version of the game, even the FMV sequences are 1:1 copies of the original game. All the sound is there as well. For music, you get CD Audio which is even higher quality then the PC original. And everything is in Stereo. If there's any horrific change in the port, its the lack of mid-level saving. Or saving in general, since you can only reload missions via passwords. This can be extremely frustrating, especially on the later levels. Technicalities aside, in case you never heard of the C&C game (which I find hard to believe) - you play a commander in a fictional third world war, based on a conflict sparked by the arrival of a valuable but extremely dangerous mineral, Tiberium. You may either lead the Global Defense Initiative global peacekeeping military division, or the NOD, a multiple millennia old underground cult led by the charismatic, enigmatic, and iconic character: Kane. With simple point and click controls, your goal is to gain territory through multiple missions, many of them optional. There's an incredible amount of diversity among missions, ranging from simple "build a base and wipe out the enemy", to defending research labs, or hijacking an enemy aircraft and demolishing a civilian town to blacked your opponent in the eye of the media. The early missions are quite easy, while the later ones are incredibly hard, but the map design is simply superb each and every time. Missions are selectable on a map screen, and there are cheesy but awesome FMV sequences before, and after every mission. Some will simply detail the destruction with CG sequences, while on most of them you are given your orders directly, face to face, from your superiors (these videos are a trademark of C&C games). While graphically C&C may not seem much when put next to all the other 2d and 3d wonders of the Sega Saturn (the ingame graphics are, in fact, proven to be recreatable by a Megadrive too), the sheer effective simplicity of the gameplay, the beyond excellent music, gripping FMV scenes and excellent storyline makes Command & Conquer an incredibly addictive game. Highly recommended if you don't have access to the PC original.